« SQL SERVER – Fix – Error – 10920 – Cannot %S_MSG user-defined function ‘%.*ls’. It is being used as a resource governor classifier. Yesterday, I was browsing few objects in SSMS in my test SQL server database and by mistake, I did a single click on an object and typed something and it got renamed and disappered from the search result. Now, what and who I renamed? I wasn’t sure 😦 Fortunately, I had a backup and I could restore and recover my objects. But what if I did not have a backup and it happens on production database ? a nightmare I’d say? Last year, I developed a tool that usually recovers the accidentally renamed table name but it does not give you the object type. After this incident, I started with my research and modified the script and now it can recover any renamed object with its object type as well. Note : It will only recover the object name if you renamed it through SSMS. 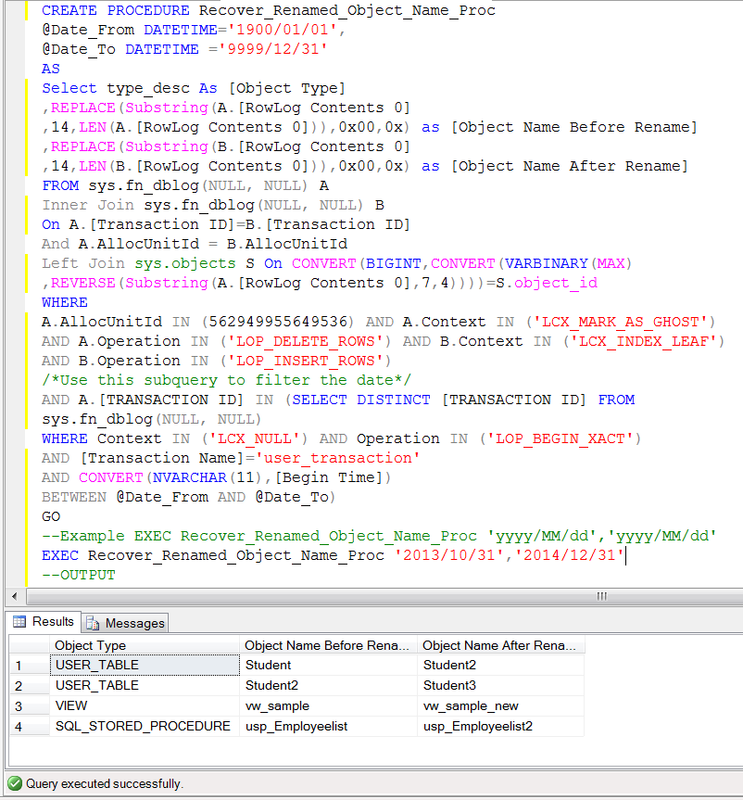 Given below is the stored procedure that can recover any object name. In case you do not know the modified date & time of any object, you can write given below query and use [modify_date] column. Can this recover an old version of a Stored Procedure?